This lovely house is located on a quiet residential road, close to good transport links, open green spaces, shops and restaurants. There are 2 bedrooms, 1 spacious bathroom, living room, a study that also acts as a 3rd double bedroom and beautiful open plan kitchen and dining room that leads out to a private garden. 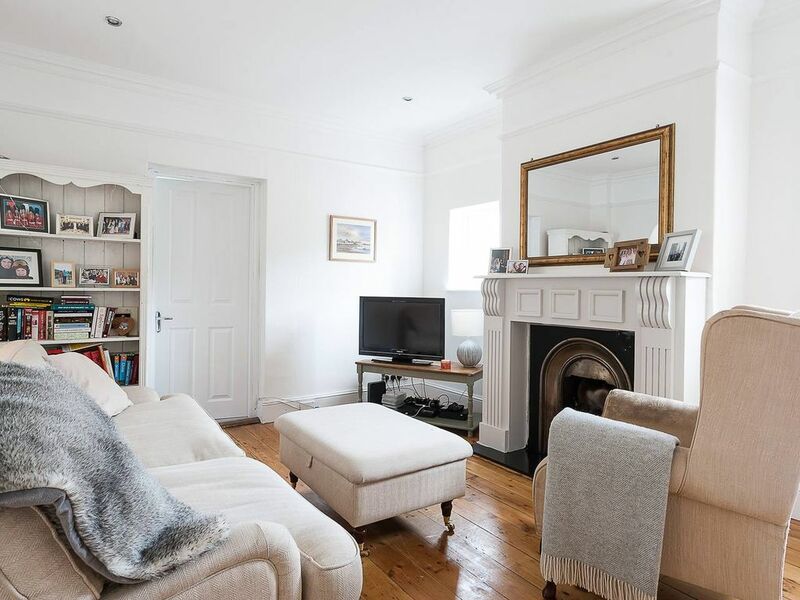 This would be a great place for up to 6 people looking to be located in a more residential area which is still easily accessible to central London. This is our home and as such you will find many of our personal items here - we ask that you treat our home with the respect that you would treat your own place! The living area has a comfortable sofa which is perfect for relaxing on after a long day out exploring what London has to offer. Here you will able to watch the smart TV which has BT channels. The kitchen and dining area is filled with natural light thanks to the garden doors that allows the light to come streaming in. On a warm sunny day it is lovely to be able to open these doors to make it feel as though you are dining al fresco. Above the dining table there are some wooden beams which add plenty of charm and character to the room. The kitchen has everything that you would need during your stay if you fancy staying in one night and cooking a delicious meal. There is a large hob and oven, a range of cooking utensils, pots and pans, plates cutlery and glasses. The dining table expands to seat 6 people comfortably and there are two bar stools under the kitchen counter which is a great place to sit and have your breakfast in the morning. The master bedroom has a sumptuous king size bed whereas the second bedroom has a double bed. I will make sure to clear some space in the wardrobes for you to be able to hang your clothes up and store your belongings neatly away. Both beds will be spotlessly made up using white hotel quality linen. In the study there is a comfortable double futon bed which can also be made up for you if requested at booking, and this room also has a playstation to use at your leisure. The spacious bathroom has a bath with a shower attachment as well as a walk in shower with a luxurious waterfall shower head. There is also a toilet and sink. Large fluffy white towels and toiletries will be provided for every guest. Downstairs next to the living room there is a separate WC. Guests have complete access to the house. Additionally I’ve arranged for a concierge service to be available to you throughout your stay, providing you with free on-demand support for booking restaurants, tickets to shows, transport...or anything else you might fancy! You can also book additional housekeeping services like regular cleans or changes of bed linen. I hope that this will help you get even more out of your stay. Full details will be provided at check-in. When I’m not there, you will be hosted by a professional hospitality company who I’ve engaged to look after you in my absence. They are on call to attend to your every need, as I would be. This property is located in a lovely residential neighbourhood. There are various open green spaces close by. This includes Barnes Common and Richmond Park. These are boh great places to spend a warm sunny day. There are plenty of brilliant places to eat and drink in Putney. The Toy shop bar is a great place to spend an evening if you fancy a few cocktails. Kew Gardens is just a 15 minute drive away. This property is in a great location in terms of being able to get around London easily. If you would like to travel around London via bus, there are a number of bus stops along Upper Richmond Road. Barnes station is a 10 minute walk away and Putney station is a 10 minute bus ride away or a 20 minute walk away. From both of these stations you will be able to get to London Waterloo in 15 minutes. East Putney tube station is a 12 minute bus ride away. From here you will be able to connect to the District Line. Please note: our standard check in times are between 3pm - 10pm. Check out is by 10am. If you wish to check in or check out outside these hours please let us know. This is subject to availability and a fee.